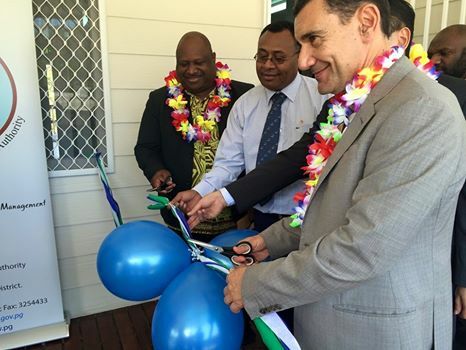 PNG Forestry Authority officially opened its new inventory office at the PNG Forestry Head Office. The office was opened by former Minister Douglas Tomuriesa, PNGFA Managing Director Tunou Sabuin and European Union Ambassador Ioannis Giogkarakis-Argyropoulos. The office will be used as an important asset that will be the central hub for National forestry Inventory work in the country. People also have access to information on PNG Forestry Inventory project after the launching of the booklet during the opening of the NFI office building. The Booklet was launched by PNGFA Managing Director Mr. Tunou Sabuin. Mr. Sabuin said the booklet has all the information of the NFI work in the country.